They are made of plush Bamboo Terry Cloth and 100% Cotton Fabric with fun prints. Sandwiched between the 2 layers is PUL for a moisture protection barrier. Grab a few and keep some in the Nappy Bag, some in the Nursery, maybe even keep some at Nanny's house. You never know how many you are going to need. They are contoured on one edge, to fit snuggly around your neck, so that they sit flat on your shoulder. Also helps to keep it in place, while positioning baby over your shoulder. The PUL has been tested and is rated for 300 washes. This will see them through a number of wash days and possibly even a few babies as well. 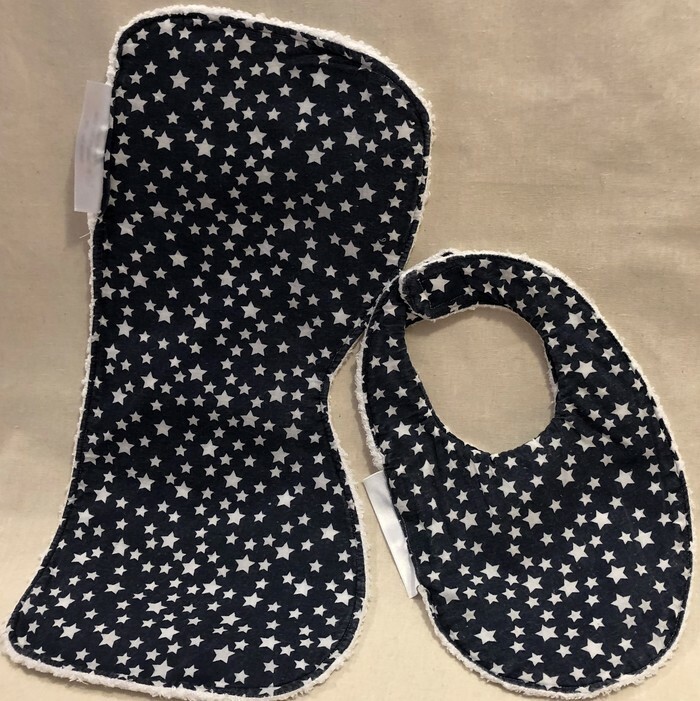 These Burp Cloths are a Large size at 40cm x 19cm Large size at 37cm x 14cm - Great for Newborns. These Sets also come in Small size at 37cm x 14cm - these are priced at $12.00 and listed separately. Bibs for both Small and Large Sets are the same size: 25cm x 17cm. Larger bibs will be available in the new year.